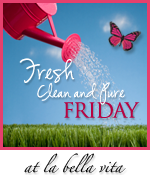 A fellow blogger at "La Bella Vita" has extended an invitation to participate in "Fresh, Clean and Pure Friday". Great idea! So here is my idea for "Fresh, Clean and Pure Friday"; pray for the person who most annoyed you this week. You know, that guy in the cubicle next to you that takes your stuff without asking. That lady that sits behind you at daily Mass and says all the prayers a half a beat behind every one else. Your kid who said something thoughtless and hurtful. The lady at the grocery store who snarled when she took your money and then put your bread at the bottom of the bag. THAT person. 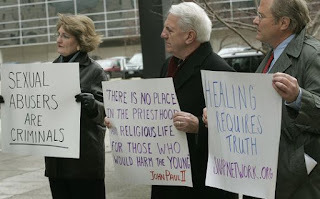 Pray that God will bless them abundantly. Pray that their life is good, and that they recognize that.